I am a staff medical physicist and researcher in the Department of Human Oncology. My work focuses on research, clinical development and implementation and clinical coverage of MR-guided radiotherapy with the ViewRay MRIdian system. Thankfully, the University of Wisconsin allowed me the opportunity to invest in unique clinical and research ventures by awarding me a Bentson Fellowship in MR-guided radiotherapy. MR guidance has enabled us to perform high-precision motion management and on-table adaptive radiotherapy that was not feasible with prior modalities. This technology has changed the radiotherapy paradigm, and it has been an honor to be at the forefront with colleagues in shaping our field for the betterment of cancer therapy. Implementing new technology into the clinic has been a challenge that I have eagerly embraced. My efforts have been focused on exploiting the online, adaptive capabilities of the MRIdian system to develop novel tumor dose escalation strategies for radiotherapy. As such, I performed, in collaboration with physics and physician colleagues, the commissioning, development and execution of the adaptive radiotherapy program on the MRIdian system at the University of Wisconsin. My additional clinical coverage of MR-guided radiotherapy includes machine and imaging QA aspects as well as treatment planning, patient simulations and pretreatment patient verification. Therapy Imaging Subcommittee (TISC) of American Association of Physicists in Medicine, committee member, 2019-pres. Journal of Applied Clinical Medical Physics, Reviewer, 2018-pres. Advances in Radiation Oncology, Reviewer, 2018-pres. Radiological Society of North America (RSNA), Member, 2018-pres. International Journal of Radiation Oncology, Biology, Physics, Reviewer, 2017-pres. New Professionals Subcommittee (NPSC) of American Association of Physicists in Medicine (AAPM), committee member, 2017–pres. American Brachytherapy Society (ABS), Member, 2017–pres. Physics in Medicine and Biology, Reviewer, 2017-pres. American Society for Radiation Oncology (ASTRO) 2016–pres. American Association of Physicists in Medicine (AAPM), 2008–pres. MR guidance has enabled us to perform high-precision motion management and on-table adaptive radiotherapy that was not feasible with prior modalities. My efforts, in collaboration with physics and physician colleagues, include the development, commissioning and implementation of novel MR-guided radiotherapy techniques, such as the online adaptive radiotherapy program at the University of Wisconsin. Adaptive radiotherapy (ART) addresses the variability of patient anatomy, either random or systematic interfraction changes. Online ART allows the ability to dynamically change the treatment plan during a treatment session. Dose-guided radiotherapy through online ART permits dose escalation/de-escalation when dose limiting organs at risk have moved away/closer to the target. The paradigm of online, on-table adaptive radiotherapy is now clinically achievable with MR-guided radiotherapy. In 2017 we implemented MR-guided online adaptive radiotherapy at the University of Wisconsin on the MRIdian (ViewRay, Inc., Cleveland, OH). Prior to clinical release, our physics team validated the safety and accuracy of the ART program. Our commissioning process included validation of the deformation and the dosimetric accuracy with an in-house heterogeneous phantom (Figure). We reported our findings of the online adaptive dosimetric and deformable accuracy and the validation of online adaptive workflow processes at the 2017 AAPM Annual Meeting. Our physics team is currently working toward commissioning the MRIdian linac system (ViewRay, Inc., Cleveland, OH. ), the next generation MR-guided radiotherapy system at the University of Wisconsin. Quality assurance procedures are being developed to characterize this novel technology. 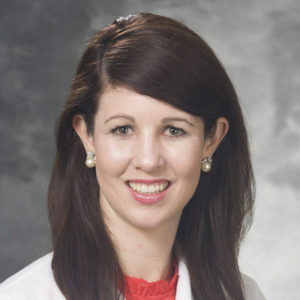 Treatment strategies are being developed that highlight the unique capabilities of the MR-linac to expand our current MR-guided radiotherapy program. 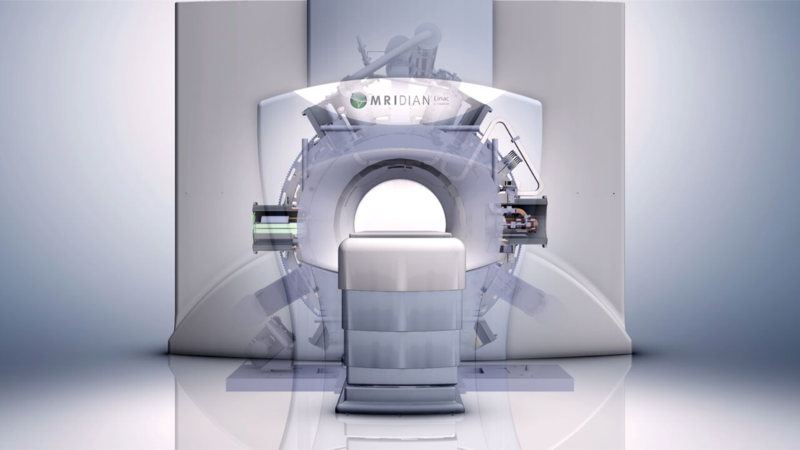 MRIdian linac system by ViewRay. Image courtesy of ViewRay Inc.
Dose-limiting structures, such as the duodenum, render the treatment of pancreatic cancer challenging. In this multi-institutional study, we assess dosimetric differences caused by interfraction pancreas-to-duodenum motion using MR-IGRT to determine the potential impact of adaptive replanning. In this work, we evaluated the indication for adaptation through evaluation of pancreas-to-duodenum interfraction motion. Adaptation was considered indicated when daily positional variations enabled dose escalation to the target while maintaining duodenal constraints. Dose escalation through online adaptation was found feasible in MR-guided pancreatic radiotherapy for fractions where GTV-to-duodenum distance increased from simulation. We reported our findings at the 2016 AAPM and ASTRO Annual Meeting. Stomach anatomy is susceptible to large interfraction motion and deformation (Figure). Thus, large treatment margins have historically been used for the treatment of gastric and gastroesophageal junction (GEJ) tumors at the expense of heathy, normal tissues. In this work we evaluated the role of adaptation as well as the margin determination in non-adpative radiotherapy. To this end, we quantified the interfraction motion and deformation in gastric and GEJ patients undergoing MR-guided radiotherapy. We observed notable interfractional change in daily stomach shape in both gastric and GEJ patients, for which adaptive radiotherapy is indicated. Details of our findings were reported at the 2016 AAPM Annual Meeting. 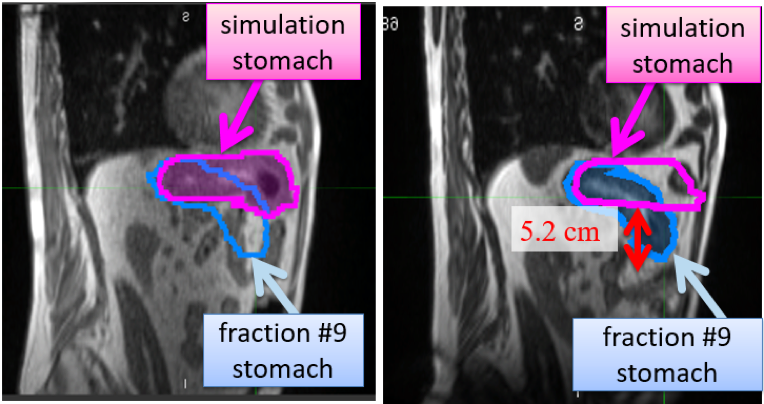 Example of interfraction stomach change from the simulation (left) to fraction #9 treatment (right) in which adaptive radiotherapy was warranted. Our treatment planning system relies on accurate modeling of the radiation characteristics. It was our task during commissioning of our new TrueBeam linac (Varian Medical Systems, Palo Alto, CA) to collect the beam data for purposes of input into the model of the treatment planning system. In this project, we first confirmed the behavior of the linac was in line with specifications, and therefore considered dosimetric equivalent to the Varian Enhanced Beam Conformance (Figure). To optimize the quality of our data collected, we determined the ideal match of the appropriate detector with respect to radiation geometry for each measurement. The beam data collected from our efforts was used to make the standard TrueBeam model for our clinic. Our efforts have allowed for acceleration of the commissioning of subsequently installed TrueBeam linacs, as the matched systems are able to share one model, once the system’s conformance to specification has been validated. 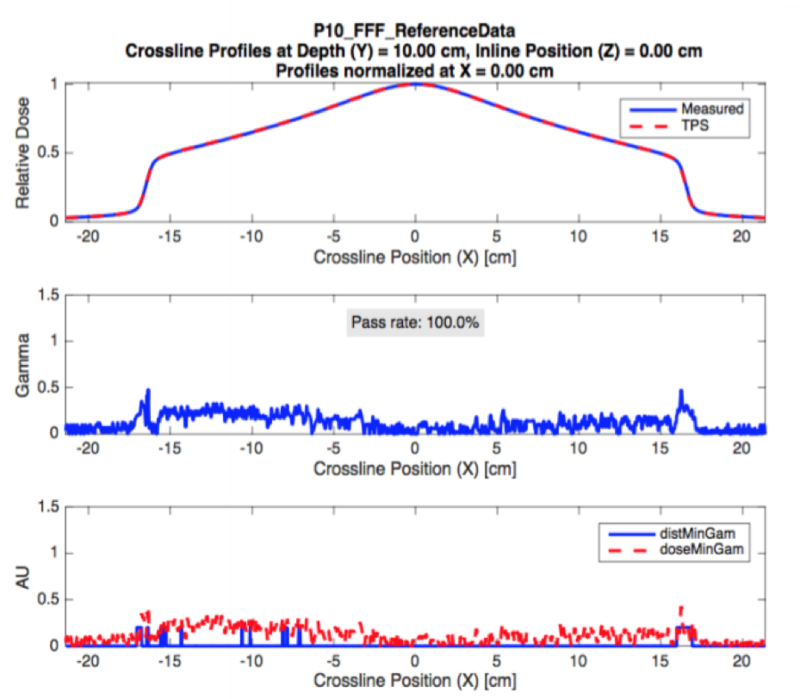 Example of validation of beam conformance for the TrueBeam radiation profile for 10 MV photon energy. Purpose: Daily magnetic resonance (MR)-guided radiation has the potential to improve stereotactic body radiation therapy (SBRT) for tumors of the liver. Magnetic resonance imaging (MRI) introduces unique variables that are untested clinically: electron return effect, MRI geometric distortion, MRI to radiation therapy isocenter uncertainty, multileaf collimator position error, and uncertainties with voxel size and tracking. All could lead to increased toxicity and/or local recurrences with SBRT. In this multi-institutional study, we hypothesized that direct visualization provided by MR guidance could allow the use of small treatment volumes to spare normal tissues while maintaining clinical outcomes despite the aforementioned uncertainties in MR-guided treatment. Methods and materials: Patients with primary liver tumors or metastatic lesions treated with MR-guided liver SBRT were reviewed at 3 institutions. Toxicity was assessed using National Cancer Institute Common Terminology Criteria for Adverse Events Version 4. Freedom from local progression (FFLP) and overall survival were analyzed with the Kaplan-Meier method and χ2 test. Results: The study population consisted of 26 patients: 6 hepatocellular carcinomas, 2 cholangiocarcinomas, and 18 metastatic liver lesions (44% colorectal metastasis). The median follow-up was 21.2 months. The median dose delivered was 50 Gy at 10 Gy/fraction. No grade 4 or greater gastrointestinal toxicities were observed after treatment. The 1-year and 2-year overall survival in this cohort is 69% and 60%, respectively. At the median follow-up, FFLP for this cohort was 80.4%. FFLP for patients with hepatocellular carcinomas, colorectal metastasis, and all other lesions were 100%, 75%, and 83%, respectively. Conclusions: This study describes the first clinical outcomes of MR-guided liver SBRT. Treatment was well tolerated by patients with excellent local control. This study lays the foundation for future dose escalation and adaptive treatment for liver-based primary malignancies and/or metastatic disease. Magnetic resonance-guided radiation therapy (MRgRT) offers advantages for image guidance for radiotherapy treatments as compared to conventional computed tomography (CT)-based modalities. The superior soft tissue contrast of magnetic resonance (MR) enables an improved visualization of the gross tumor and adjacent normal tissues in the treatment of abdominal and thoracic malignancies. Online adaptive capabilities, coupled with advanced motion management of real-time tracking of the tumor, directly allow for high-precision inter-/intrafraction localization. The primary aim of this case series is to describe MR-based interventions for localizing targets not well-visualized with conventional image-guided technologies. 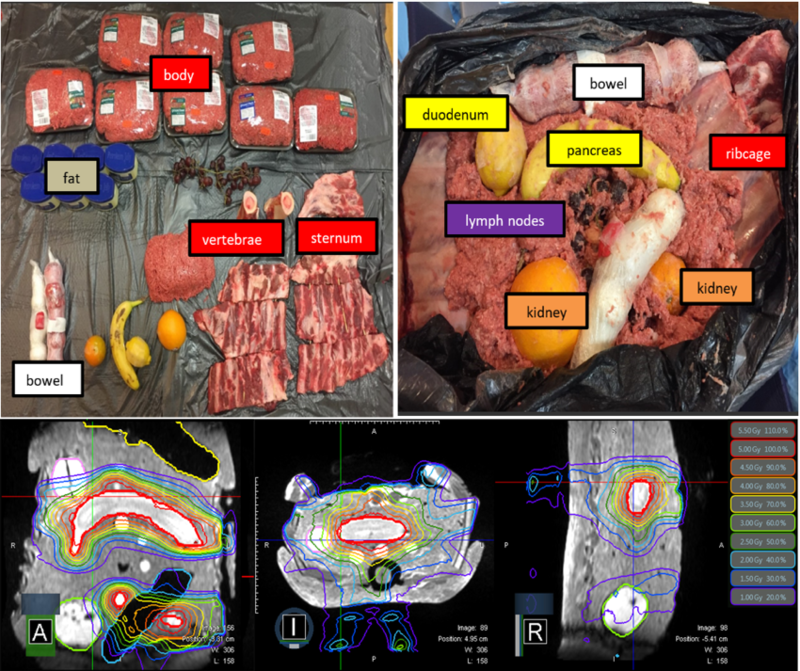 The abdominal and thoracic sites of the lung, kidney, liver, and gastric targets are described to illustrate the technological advancement of MR-guidance in radiotherapy. Radiation therapy to the prostate involves increasingly sophisticated delivery techniques and changing fractionation schedules. With a low estimated α/β ratio, a larger dose per fraction would be beneficial, with moderate fractionation schedules rapidly becoming a standard of care. The integration of a magnetic resonance imaging (MRI) scanner and linear accelerator allows for accurate soft tissue tracking with the capacity to replan for the anatomy of the day. Extreme hypofractionation schedules become a possibility using the potentially automated steps of autosegmentation, MRI-only workflow, and real-time adaptive planning. The present report reviews the steps involved in hypofractionated adaptive MRI-guided prostate radiation therapy and addresses the challenges for implementation. PURPOSE: Commercial optical tracking system such as BrainLab ExacTrac© suffers from ambiguous markers which can cause significant delay in patient treatment. We developed an ambiguity-free optical tracking system for high precision SBRT. METHODS: The optical tracking system consists of a pair of camera sensors, 4∼8 infra-red (IR) reflective markers affixed on patient skin and in-house developed software. We developed an effective algorithm to automatically eliminate ambiguous markers. A recursive backtracking algorithm was developed to build one-to-one correspondence between reference markers and optical markers. The algorithm was able to deal with missing, misplaced, or occluded markers by introducing 'dummy' markers. Isocenter displacements were calculated in six-degree of freedom through rigid-body registration between reference markers and optical markers. The system accuracy was evaluated with a pelvis phantom against cone beam CT (CBCT) and ExacTrac. The impact of number of markers on tracking accuracy was also evaluated. The performance of automatic ambiguity elimination was assessed with synthetic and clinic marker patterns. RESULTS: Difference of isocenter displacement reported by our system and commercial systems (CBCT, ExacTrac) were within 0.5 mm/0.1o. Impact of number of markers on tracking accuracy in our phantom test was negligible with isocenter displacement varying within 0.2 mm/0.2o when number of markers varied from 4 to 8. The system successfully identified and eliminated ambiguous markers in both synthetic and clinic marker patterns. CONCLUSIONS: An accurate optical tracking system free of ambiguous markers was developed for patient positioning and monitoring in high precision SBRT. The developed algorithms to eliminate ambiguous markers and to handle missing, misplaced or occluded markers were effective and efficient. PURPOSE: To develop an accurate and efficient single-marker-based optical tracking system to enhance patient safety and quality of care in radiotherapy. METHODS: The optical tracking system consists of a Polaris camera as well as in-house software. The camera is mounted inside the treatment room and detects the location of a single infra-red (IR) reflective marker affixed on patient skin in real-time. The tracking system safeguards patient from treating wrong sites by comparing real-time marker position to the position predicted by virtual simulation, which is independent of couch or any indexing system. The deviation of marker position is shown in color (red or green) to indicate accuracy of patient positioning. The system works in concert with record-and-verify (R&V) system to further enhance patient safety and smooth clinic work flow. Marker information matching the patient under treatment is automatically loaded by the tracking system when a setup or treatment field is loaded in R&V. In non-coplanar treatment, the system automatically adjusts expected marker coordinators by accounting for each beam's couch angle extracted from R&V. RESULTS: Accuracy of the developed tracking system on a pelvis phantom has been verified against a CBCT system to be within 1.0 mm for coplanar treatment. In non-coplanar treatment, uncertainty of the system increases as the distance of the marker relative to treatment isocenter. The system precisely and automatically loads in patient and marker information for each beam, in concert with our R&V system. CONCLUSIONS: We have developed an accurate and efficient single IR marker-based optical tracking system for patient treatment position verification. It significantly enhances patient safety with streamlined clinic work flow. The system can be readily upgraded for high-precision radiotherapy with the use of multiple markers (>4). PURPOSE: To optimize planning and delivery efficiency, and quality of head and neck IMRT through the evaluation of planning parameters. This study also serves to identify the impact on dose accuracy due to calculation grid size. METHODS: Eleven head and neck patients, 45 trials per patient (495 trials in total), were evaluated varying IMRT parameters of dose grid, minimum MU per segment, minimum segment area, and control point number. Plans were recomputed on Pinnacle Treatment Planning System (TPS), and scaled to the planning target volume (PTV) constraint of 95% volume. Differential dose volume histograms (DVHs) were exported, and a program was written to compile DVH results. Plans were delivered on an Elekta Synergy linear accelerator to assess delivery time. Plan quality, calculation time, and delivery time served as this study's endpoints. RESULTS: The 4 mm dose grid with 2 mm fluence grid in each direction, saving 1/3 the computation time, were most comparable by DVH results to the 2 mm dose and fluence grid. Dose uncertainty due to dose calculation grid effect was as high as 8.2%, 5.5 Gy for PTVs and 13.3%, 2.1 Gy for organs at risk. Smaller volumes and high gradient regions were more susceptible to uncertainties. Threshold values that maintained adequate plan quality were 5 cm(2) for minimum segment area and 5 MU for minimum MU. Minimum MU was more costly in terms of plan quality compared to the minimum segment area. CONCLUSIONS: DVH differences can be effectively used to quantify the dose grid calculation uncertainty. For minimum MU and segment area, the DVH differences are an effect of the intensity map, defined by MLC shape and the number of control points. Exceeding the adequate number of control points diminishes returns of plan quality and increases patient treatment time. PURPOSE: We implemented an electronic event-reporting system to investigate its effect on quality improvement in our department. METHODS: We developed an event-reporting program that launched in October 2012; data analysis was performed in January 2014. Events were logged by the radiation oncology staff and reviewed by our quality and safety committee on a biweekly basis. To measure the efficacy of the new program, and change in safety culture, a Likert-scale survey was administered before, and three months after, implementation of the event-reporting system. RESULTS: A total of 194 events were logged into the new system during a 15-month period (approximately 13 events per month), compared with 93 events in an 18-month period (approximately five events per month) before the program was launched. The average number of events reported by radiation therapists increased from 0.9 per month to 8.6 per month. The survey results showed a shift toward stronger agreement by staff members, in postimplementation versus preimplementation responses, when they were asked if they knew how to report an event in the department (P = .042), and if the current event-reporting system would reduce the incidence of future events (P = .032). Results showed a trend toward stronger agreement by staff members when they were asked if they felt more comfortable reporting events that they had observed (P = .093). Multiple safety action plans were implemented as a result of analysis of these events. CONCLUSIONS: An electronic event-reporting system streamlines quality and safety in a radiation oncology department by increasing reported events and promoting a safety culture. A program that is widely accessible, easy to use, and can analyze data meaningfully will be the most successful. PURPOSE: Recent knowledge on the effects of cardiac toxicity warrants greater precision for left-sided breast radiotherapy. Different breath-hold (BH) maneuvers (abdominal vs thoracic breathing) can lead to chest wall positional variations, even though the patient's tidal volume remains consistent. This study aims to investigate the feasibility of using optical tracking for real-time quality control of active breathing coordinator (ABC)-assisted deep inspiration BH (DIBH). METHODS: An in-house optical tracking system (OTS) was used to monitor ABC-assisted DIBH. The stability and localization accuracy of the OTS were assessed with a ball-bearing phantom. Seven patients with left-sided breast cancer were included. A free-breathing (FB) computed tomography (CT) scan and an ABC-assisted BH CT scan were acquired for each patient. The OTS tracked an infrared (IR) marker affixed over the patient's xiphoid process to measure the positional variation of each individual BH. Using the BH within which the CT scan was performed as the reference, the authors quantified intra- and interfraction BH variations for each patient. To estimate the dosimetric impact of BH variations, the authors studied the positional correlation between the marker and the left breast using the FB CT and BH CT scans. The positional variations of 860 BHs as measured by the OTS were retrospectively incorporated into the original treatment plans to evaluate their dosimetric impact on breast and cardiac organs [heart and left anterior descending (LAD) artery]. RESULTS: The stability and localization accuracy of the OTS was within 0.2 mm along each direction. The mean intrafraction variation among treatment BHs was less than 2.8 mm in all directions. Up to 12.6 mm anteroposterior undershoot, where the patient's chest wall displacement of a BH is less than that of a reference BH, was observed with averages of 4.4, 3.6, and 0.1 mm in the anteroposterior, craniocaudal, and mediolateral directions, respectively. A high positional correlation between the marker and the breast was found in the anteroposterior and craniocaudal directions with respective Pearson correlation values of 0.95 and 0.93, but no mediolateral correlation was found. Dosimetric impact of BH variations on breast coverage was negligible. However, the mean heart dose, mean LAD dose, and max LAD dose were estimated to increase from 1.4/7.4/18.6 Gy (planned) to 2.1/15.7/31.0 Gy (delivered), respectively. CONCLUSIONS: In ABC-assisted DIBH, large positional variation can occur in some patients, due to their different BH maneuvers. The authors' study has shown that OTS can be a valuable tool for real-time quality control of ABC-assisted DIBH. PURPOSE: To propose a simple model to explain the origin of ghost markers in marker-based optical tracking systems (OTS) and to develop retrospective strategies to detect and eliminate ghost markers. METHODS: In marker-based OTS, ghost markers are virtual markers created due to the cross-talk between the two camera sensors, which can lead to system execution failure or inaccuracy in patient tracking. As a result, the users have to limit the number of markers and avoid certain marker configurations to reduce the chances of ghost markers. In this work, the authors propose retrospective strategies to detect and eliminate ghost markers. The two camera sensors were treated as mathematical points in space. The authors identified the coplanar within limit (CWL) condition as the necessary condition for ghost marker occurrence. A simple ghost marker detection method was proposed based on the model. Ghost marker elimination was achieved through pattern matching: a ghost marker-free reference set was matched with the optical marker set observed by the OTS; unmatched optical markers were eliminated as either ghost markers or misplaced markers. The pattern matching problem was formulated as a constraint satisfaction problem (using pairwise distances as constraints) and solved with an iterative backtracking algorithm. Wildcard markers were introduced to address missing or misplaced markers. An experiment was designed to measure the sensor positions and the limit for the CWL condition. The ghost marker detection and elimination algorithms were verified with samples collected from a five-marker jig and a nine-marker anthropomorphic phantom, rotated with the treatment couch from -60° to +60°. The accuracy of the pattern matching algorithm was further validated with marker patterns from 40 patients who underwent stereotactic body radiotherapy (SBRT). For this purpose, a synthetic optical marker pattern was created for each patient by introducing ghost markers, marker position uncertainties, and marker displacement. RESULTS: The sensor positions and the limit for the CWL condition were measured with excellent reproducibility (standard deviation ≤ 0.39 mm). The ghost marker detection algorithm had perfect detection accuracy for both the jig (1544 samples) and the anthropomorphic phantom (2045 samples). Pattern matching was successful for all samples from both phantoms as well as the 40 patient marker patterns. CONCLUSIONS: The authors proposed a simple model to explain the origin of ghost markers and identified the CWL condition as the necessary condition for ghost marker occurrence. The retrospective ghost marker detection and elimination algorithms guarantee complete ghost marker elimination while providing the users with maximum flexibility in selecting the number of markers and their configuration to meet their clinic needs. Treatment of the wrong body part due to incorrect setup is among the leading types of errors in radiotherapy. The purpose of this paper is to report an efficient automatic patient safety system (PSS) to prevent gross setup errors. The system consists of a pair of charge-coupled device (CCD) cameras mounted in treatment room, a single infrared reflective marker (IRRM) affixed on patient or immobilization device, and a set of in-house developed software. Patients are CT scanned with a CT BB placed over their surface close to intended treatment site. Coordinates of the CT BB relative to treatment isocenter are used as reference for tracking. The CT BB is replaced with an IRRM before treatment starts. PSS evaluates setup accuracy by comparing real-time IRRM position with reference position. To automate system workflow, PSS synchronizes with the record-and-verify (R&amp;V) system in real time and automatically loads in reference data for patient under treatment. Special IRRMs, which can permanently stick to patient face mask or body mold throughout the course of treatment, were designed to minimize therapist's workload. Accuracy of the system was examined on an anthropomorphic phantom with a designed end-to-end test. Its performance was also evaluated on head and neck as well as abdominalpelvic patients using cone-beam CT (CBCT) as standard. The PSS system achieved a seamless clinic workflow by synchronizing with the R&amp;V system. By permanently mounting specially designed IRRMs on patient immobilization devices, therapist intervention is eliminated or minimized. Overall results showed that the PSS system has sufficient accuracy to catch gross setup errors greater than 1 cm in real time. An efficient automatic PSS with sufficient accuracy has been developed to prevent gross setup errors in radiotherapy. The system can be applied to all treatment sites for independent positioning verification. It can be an ideal complement to complex image-guidance systems due to its advantages of continuous tracking ability, no radiation dose, and fully automated clinic workflow. PURPOSE: Our previous study [B. Lu et al., "A patient alignment solution for lung SBRT setups based on a deformable registration technique," Med. Phys. 39(12), 7379-7389 (2012)] proposed a deformable-registration-based patient setup strategy called the centroid-to-centroid (CTC) method, which can perform an accurate alignment of internal-target-volume (ITV) centroids between averaged four-dimensional computed tomography and cone-beam computed tomography (CBCT) images. Scenarios with variations between CBCT and simulation CT caused by irregular breathing and/or tumor change were not specifically considered in the patient study [B. Lu et al., "A patient alignment solution for lung SBRT setups based on a deformable registration technique," Med. Phys. 39(12), 7379-7389 (2012)] due to the lack of both a sufficiently large patient data sample and a method of tumor tracking. The aim of this study is to thoroughly investigate and compare the impacts of breathing pattern and tumor change on both the CTC and the translation-only (T-only) gray-value mode strategies by employing a four-dimensional (4D) lung phantom. METHODS: A sophisticated anthropomorphic 4D phantom (CIRS Dynamic Thorax Phantom model 008) was employed to simulate all desired respiratory variations. The variation scenarios were classified into four groups: inspiration to expiration ratio (IE ratio) change, tumor trajectory change, tumor position change, tumor size change, and the combination of these changes. For each category the authors designed several scenarios to demonstrate the effects of different levels of breathing variation on both of the T-only and the CTC methods. Each scenario utilized 4DCT and CBCT scans. The ITV centroid alignment discrepancies for CTC and T-only were evaluated. The dose-volume-histograms (DVHs) of ITVs for two extreme cases were analyzed. RESULTS: Except for some extreme cases in the combined group, the accuracy of the CTC registration was about 2 mm for all cases for both the single and the combined scenarios. The performance of the CTC method was insensitive to region-of-registration (ROR) size selections, as suggested by the comparable accuracy between 1 and 2 cm expansions of the ROR selections for the method. The T-only method was suitable for some single scenarios, such as trajectory variation, position variation, and size variation. However, for combined scenarios and/or a large variation in the IE ratio, the T-only method failed to produce reasonable registration results (within 3 mm). The discrepancy was close to, or even greater than, 1 cm. In addition, unlike the CTC method, the T-only method was sensitive to the ROR size selection. The DVH analysis suggested that a large ITV to PTV margin should be considered if a breathing pattern variation is observed. CONCLUSIONS: The phantom study demonstrated that the CTC method was reliable for scenarios in which breathing pattern variation was involved. The T-only gray value method worked for some scenarios, but not for scenarios that involved an IE ratio variation. For scenarios involving position variation, the T-only method worked only with a careful selection of the ROR, whereas the CTC method was independent of ROR size as long as the ITVs were included in the ROR. One indication of the dose consequence analysis was that a large ITV to PTV margin should be considered if a breathing pattern variation is observed. PURPOSE: To improve planning and delivery efficiency of head and neck IMRT without compromising planning quality through the evaluation of inverse planning parameters. METHODS: Eleven head and neck patients with pre-existing IMRT treatment plans were selected for this retrospective study. The Pinnacle treatment planning system (TPS) was used to compute new treatment plans for each patient by varying the individual or the combined parameters of dose∕fluence grid resolution, minimum MU per segment, and minimum segment area. Forty-five plans per patient were generated with the following variations: 4 dose∕fluence grid resolution plans, 12 minimum segment area plans, 9 minimum MU plans, and 20 combined minimum segment area∕minimum MU plans. Each plan was evaluated and compared to others based on dose volume histograms (DVHs) (i.e., plan quality), planning time, and delivery time. To evaluate delivery efficiency, a model was developed that estimated the delivery time of a treatment plan, and validated through measurements on an Elekta Synergy linear accelerator. RESULTS: The uncertainty (i.e., variation) of the dose-volume index due to dose calculation grid variation was as high as 8.2% (5.5 Gy in absolute dose) for planning target volumes (PTVs) and 13.3% (2.1 Gy in absolute dose) for planning at risk volumes (PRVs). Comparison results of dose distributions indicated that smaller volumes were more susceptible to uncertainties. The grid resolution of a 4 mm dose grid with a 2 mm fluence grid was recommended, since it can reduce the final dose calculation time by 63% compared to the accepted standard (2 mm dose grid with a 2 mm fluence grid resolution) while maintaining a similar level of dose-volume index variation. Threshold values that maintained adequate plan quality (DVH results of the PTVs and PRVs remained satisfied for their dose objectives) were 5 cm(2) for minimum segment area and 5 MU for minimum MU. As the minimum MU parameter was increased, the number of segments and delivery time were decreased. Increasing the minimum segment area parameter decreased the plan MU, but had less of an effect on the number of segments and delivery time. Our delivery time model predicted delivery time to within 1.8%. CONCLUSIONS: Increasing the dose grid while maintaining a small fluence grid allows for improved planning efficiency without compromising plan quality. Delivery efficiency can be improved by increasing the minimum MU, but not the minimum segment area. However, increasing the respective minimum MU and∕or the minimum segment area to any value greater than 5 MU and 5 cm(2) is not recommended because it degrades plan quality. PURPOSE: In this work, the authors propose a novel registration strategy for translation-only correction scenarios of lung stereotactic body radiation therapy setups, which can achieve optimal dose coverage for tumors as well as preserve the consistency of registrations with minimal human interference. METHODS: The proposed solution (centroid-to-centroidor CTC solution) uses the average four-dimensional CT (A4DCT) as the reference CT. The cone-beam CT (CBCT) is deformed to acquire a new centroid for the internal target volume (ITV) on the CBCT. The registration is then accomplished by simply aligning the centroids of the ITVs between the A4DCT and the CBCT. Sixty-seven cases using 64 patients (each case is associated with separate isocenters) have been investigated with the CTC method and compared with the conventional gray-value (G) mode and bone (B) mode registration methods. Dosimetric effects among the tree methods were demonstrated by 18 selected cases. The uncertainty of the CTC method has also been studied. RESULTS: The registration results demonstrate the superiority of the CTC method over the other two methods. The differences in the D99 and D95 ITV dose coverage between the CTC method and the original plan is small (within 5%) for all of the selected cases except for one for which the tumor presented significant growth during the period between the CT scan and the treatment. Meanwhile, the dose coverage differences between the original plan and the registration results using either the B or G method are significant, as tumor positions varied dramatically, relative to the rib cage, from their positions on the original CT. The largest differences between the D99 and D95 dose coverage of the ITV using the B or G method versus the original plan are as high as 50%. The D20 differences between any of the methods versus the original plan are all less than 2%. CONCLUSIONS: The CTC method can generate optimal dose coverage to tumors with much better consistency compared with either the G or B method, and it is especially useful when the tumor position varies greatly from its position on the original CT, relative to the rib cage. PURPOSE: The purpose of this work is to investigate the impact of small rotational errors on the magnitudes and distributions of spatial dose variations for intracranial stereotactic radiotherapy (SRT) treatment setups, and to assess the feasibility of using the original dose map overlaid with rotated contours (ODMORC) method as a fast, online evaluation tool to estimate dose changes (using DVHs) to clinical target volumes (CTVs) and organs-at-risks (OARs) caused by small rotational setup errors. METHODS: Fifteen intracranial SRT cases treated with either three-dimensional conformal radiation therapy (3DCRT) or intensity-modulated radiation therapy (IMRT) techniques were chosen for the study. Selected cases have a variety of anatomical dimensions and pathologies. Angles of ±3° and ±5° in all directions were selected to simulate the rotational errors. Dose variations in different regions of the brain, CTVs, and OARs were evaluated to illustrate the various spatial effects of dose differences before and after rotations. DVHs accounting for rotations that were recomputed by the treatment planning system (TPS) and those generated by the ODMORC method were compared. A framework of a fast algorithm for multicontour rotation implemented by ODMORC is introduced as well. RESULTS: The average values of relative dose variations between original dose and recomputed dose accounting for rotations were greater than 4.0% and 10.0% in absolute mean and in standard deviation, respectively, at the skull and adjacent regions for all cases. They were less than 1.0% and 2.5% in absolute mean and in standard deviation, respectively, for dose points 3 mm away from the skull. The results indicated that spatial dose to any part of the brain organs or tumors separated from the skull or head surface would be relatively stable before and after rotations. Statistical data of CTVs and OARs indicate the lens and cochleas have the large dose variations before and after rotations, whereas the remaining ROIs have insignificant dose differences. DVH comparisons suggest that the ODMORC method is able to estimate the DVH of CTVs fairly accurately (within 1.5% of relative dose differences for evaluation volumes). The results also show that most of the OARs including the brain stem, spinal cord, chiasm, hippocampuses, optic nerves, and retinas, which were relatively distal from the skull and surface, had good agreement (within 2.0% of relative dose differences for 0.1 cc of the volumes ) between the ODMORC method and the recomputation, whereas OARs more proximate to the bone-tissue interface or surface, such as the lenses and cochlea, had larger dose variations (greater than 5.0%) for some cases due to the incapability of the ODMORC to account for scatter contribution variations proximate to interfaces and intrinsic dose calculation uncertainties for ROIs with small volumes. CONCLUSIONS: The ODMORC method can be implemented as an online evaluation system for rotation-induced dose changes of CTVs and most OARs and for other related dose consequence analyses.